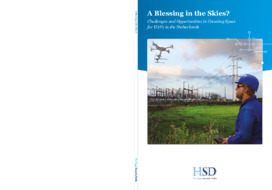 TNO, founding partner of HSD, investigated the issues and corresponding risks which arise from the introduction and use of drones in the national airspace. This study was requested by the Innovation Team of the Ministry of Security and Justice on behalf of the inter departmental working group. The usage of drones and the data they generate creates opportunities for the development of new products and services. But it also has a down side. There is a growing increase in society with regard to incidents and near-incidents. Besides the risks in the area of safety, on the ground as well as in the air, there are also concerns regarding security and privacy. Drones are used for different purposes and the control of drones in certain airspaces is crucial. The issues identified in the report are primarily related to safety and security and to the corresponding regulatory framework and law enforcement. A number of interviews was held with relevant stakeholders, addressing their specific issues. For most of these risks, a quantitative assessment is not available, neither on the probability of occurrence nor on the impact. This makes a discussion about risks and risk assessment only possible in a qualitative way. To allow a proper evaluation of risks, risk acceptance levels should be defined by the government. The approach of Networked Risk Management (NRM) is suggested for an issue as complex as the safe and secure use of drones in the national airspace, because traditional risk management techniques often become too complex and do not take into account all relevant relations. Besides the risks TNO identified a number of technical measures that can attribute to enhancing the safety and security. The study provides a base for further policy development in cooperation with stakeholders and operational organizations. It is only natural when looking at relevance, the many societal sectors involved and the national importance of security that the government takes the lead. That is also why the inter departmental working group took the initiative fro this study. Due to the complexity and many angles of this area a recommendation is to put together the operational knowledge and insights on law enforcement with the knowledge and knowhow developed and tested in the field by TNO and other parties.